i get this all the time after the update! I fear this is the best we're gonna get, unfortunately. At some point, optimization went out the window completely. Used to get at least 80fps until September/October (can't remember exactly which patch) and now it basically maxes out at 65 and often sits below 60. The difference is staggering. A lot of counselors already have 10 in some stats. Stamina is actually the only stat that has not yet had a character have 10 in it. My guess is they want to create characters that have stat combinations we haven't seen yet. For everyone complaining about Shelly's stats, the solution is to improve the functions of the stats that players dislike, like Stealth and Composure, rather than re-allocate stat points to suit the CURRENT meta. As for the patch, overall I think it is an improvement over the last patch. The two main things that need to be addressed now are the invisible window barriers and the melee hit detection. I'd also really like if they took out the objective items showing up on the map. Or at least give the items a timer before they show up. Just far too easy for counselors if the items are more or less blinking for all to see with no effort in working together required. If its not a toggle option in private it should be. For public, I really like it because many people do not play with mikes, and even those that have mikes often refuse to try working cooperatively in my experience. I can't really think of a better and realistic option to try bridging the gap between intended and actual teamwork than this. I say try primarily because I still find plenty of objective items in buildings with drawers left open, which do not appear on the map because some people just ignore them completely. So, you guys didn’t release Bots 2 months ago because in October like once promised because you said that you guys had bots shouting at random which is probably the only thing that “doesn’t” happen you guys told me two months ago you had Counsellors opening and closing doors over and over well that happens still, once Jarvis comes into the map he has a pocket knife and map and first aid SO therefore when he goes and find something he already has like a map or pocket knife he’s stuck opening and closing the same shelf. Another one is id when the Counsellors run away from you they tend to run back to you again....also some Counsellors g through windows and come straight right back out then again. Seems like ya didn’t get very far with A.i Bots to me, still a lot of fixing to do but at least you guys released it, fast way to level up our accounts. thaks for the offline bots, now i can just chill as jason. i also solved the virtual cabin and wow, what a very interesting and creative experience. keep up the good work. i know its meant as a reward for backers, but i think 2018 should be a year when we all get it. either buying or unlocking, i think those who stuck around should get it. usually exclusive items eventually become available to the masses. Should have backed the game. It was ment to be a backer EXCLUSIVE. 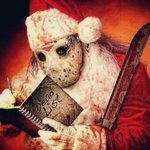 The developers even said they WILL NOT release the Savini Jason for sale. Exclusives for basic preorders do usually go public, but this wasn't just a basic pre-order bonus, this was to entice people to invest in the CREATION of the game not to sell it, there is a big difference. How is the performance with bots? And is there and increase in resolution for bots and the VC? Same from the same, increase resolution dont affect performance if you have hi end gpu like 1080 or 1080ti example, but preset epic have many fps drop hawever hardware you have, important detail you cant use your gpu at 100%. I remember in the first 3 months of the game i can use my gpu in your maximum without v-sync, after august patch seems to be generating a "bottleneck" limiting GPU use. I know all that, I mean do the bots and virtual cabin have higher resolution textures or extra fog, etc. Is there any boost in the graphics vs the multiplayer? I also had to turn on Vsync in the last month because I started getting screen tearing which never happened before. Anyone else getting an issue with Jason's grab range becoming insane around the car? Twice I had Jason body block the car, I get out and start running away, and he managed to grab me an entire car length away both times. Ooo I hope they don't fix that before I get to play again. Nobody's getting that goddamn car! No offence, but all this complaining about the 100% achievement bug is getting old and nobody needs to read about it anymore. You all probably boosted to get there so it's hard to have sympathy. 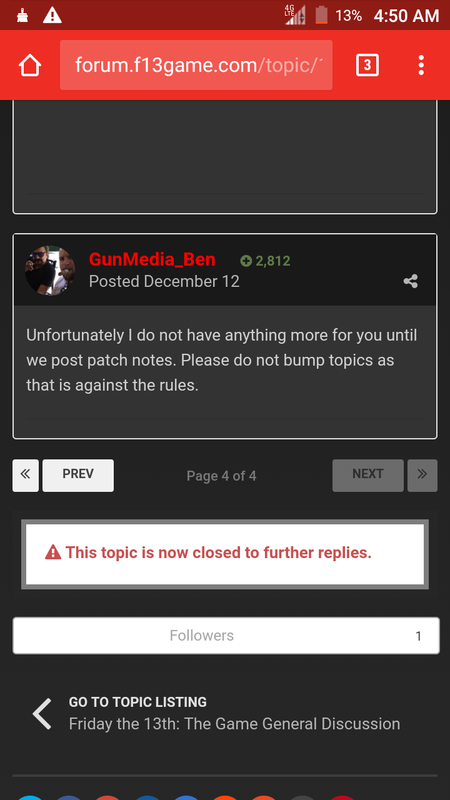 Bottom line is, the devs are looking into it and will fix it when they find it. They're not ignoring you. What they should do is fix it and then ban the ones that boosted to get there. Pardon my ignorance, Captain Jones. What is this "boosting" of which you speak? For those of us whom have not yet quite laid out the jargon. Don't let @Moe9999633, lest she tell you to charge your phone. Most of these terms are new to me too. Boosting is when u and a friend play on the same account, so that account is constantly getting points. Or they play with a friend just to get what they need, be it points or specific kills. Oh and I'm not a Captain yet. I'm still a Detective. You missed the boat on that, it was sold until March 2017 for $6. Sorry, it's not coming back. After updating I was able to reinstall the clothing pack. Easy coming from someone that can log on the game they paid for and play it anytime. As for boosting, what people do in private matches is up to them. Its not getting old complaining about it, especially for the people who have not been able to play since SEPTEMBER.